I’m a full timer. 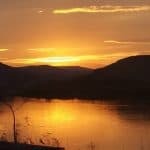 That is… I live in my camper, a fifth wheel throughout the year, day in and day out. 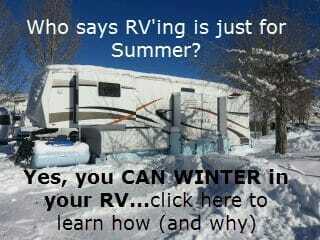 I chose the camper I live in because it is WELL built and one of the FEW true 4 season trailers. Not only do I live in mine all year, but I spend about 1/2 the year in COLD weather – specifically the northern Rocky Mountains. Yes, I know I’m crazy, but I’m a ski instructor and I love skiing all winter and that’s hard to find in South Florida or even southern Arizona! When I conducted my search for the best camper for my needs, quality of construction and 4 season capability were my two top priorities. 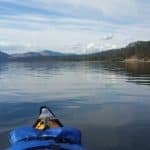 As with the purchase of any camper, there were aspects of it I found to be “less than optimal” for my lifestyle and needs. I knew however that “down the road”, I would be able to modify the campers interior to meet my needs. 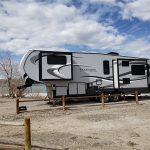 I opted for a rear living fifth wheel trailer with “dual opposing slides” – this provides the maximum living space when camped. There is also a bedroom slide and the bed is oriented “east-west” which allows for a full width closet in the front cap. 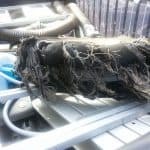 I have prepared both a video and taken some photos to show what I had done. 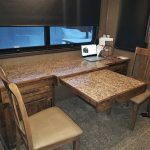 I’m doing this simply to show you how you can take charge of your campers interior and modify it – in some cases quite drastically – to make it work for YOU. With both modifications, I commissioned private cabinet workers and while I’d be glad to promote them, frankly the one who did the drawers does not deserve my praise (his work was marginal and required further adjustments after the initial install) and the cabinet maker of my major project does not want the promotion as he has more than enough work to keep himself busy! 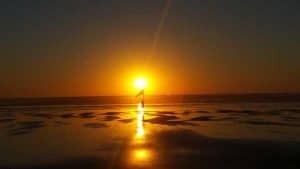 As I reflect upon the QUALITY of what he created I fully understand why he has more work than he can handle! I’m going to direct the majority of my remaining comments to the major project. Before installing the custom furniture, the original dining table had to be removed. Fortunately, it was able to come apart into pieces small enough to be easily removed from the camper. 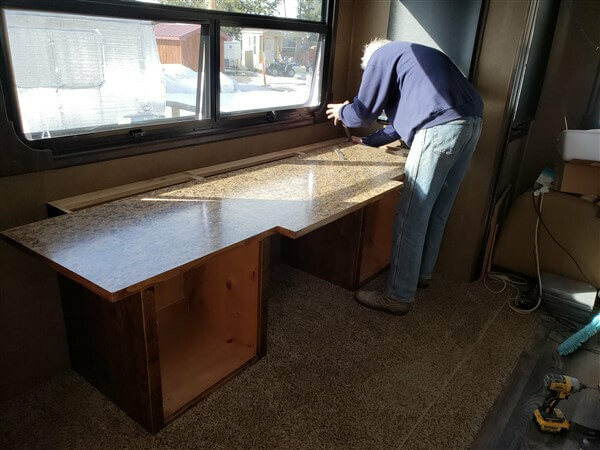 My new custom RV furniture was constructed in 3 pieces. 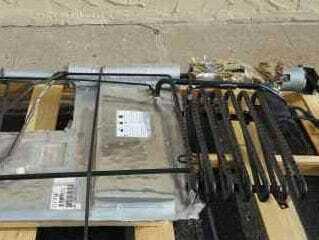 The top was affixed to tie the 3 pieces together. Will it weigh too much for the slideout? 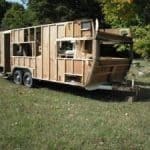 Can it be safely mounted/secured inside the camper? 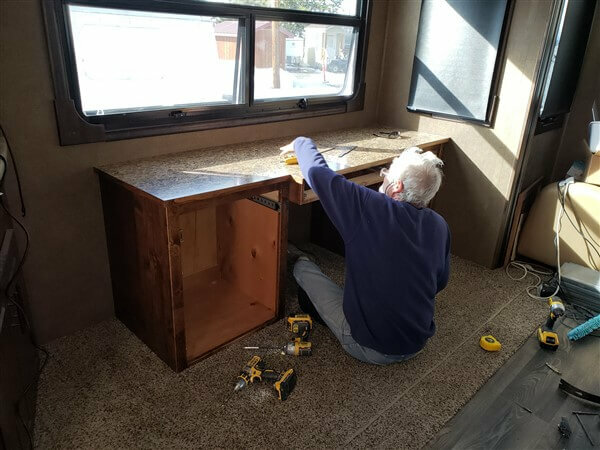 Continued installation of the custom rv furniture. In other words, I tried to insure that all factors that needed to be considered were thought out before any materials were purchased or any construction began. 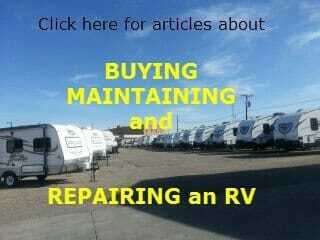 Need more “RV Stuff“? Check out what I personally use and recommend HERE. If drawers and doors are to be utilized – will they close securely as this is necessary inside a moving camper. With this knowledge, the fellow who built the furniture proceeded to build and then install it. The job was completed with minimal difficulty – actually inside of a couple of hours after he finished all his construction within his shop. 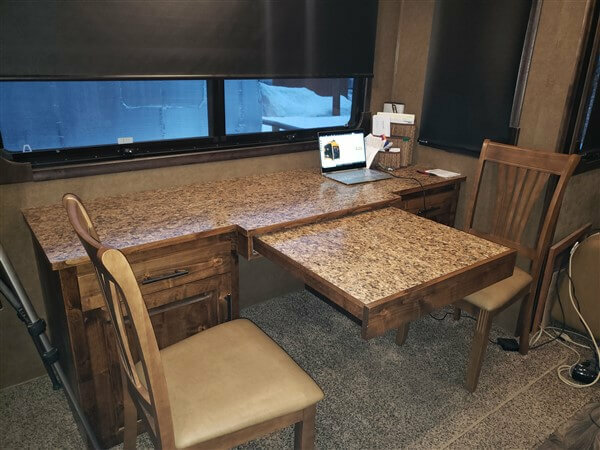 Custom RV furniture – Am I satisfied? You bet I’m satisfied! 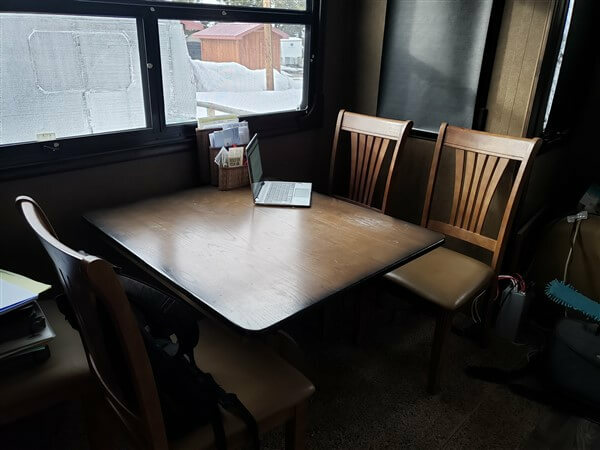 The piece I had built fits my needs exactly as I anticipated – I have increased my available storage, maintained sufficient eating area, created a functional work space, and in the area under the breakfast nook, I plan to add an electric stove type fireplace! Commit all plans to paper and double (triple) check all measurements. Get multiple quotes for the work you’d like done. In my case there was over a $1000. difference between some quotes. When searching for the right person to do the work, ask around and don’t rely exclusively upon Google searches. 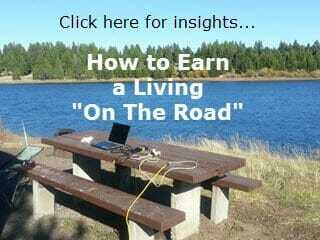 In my case it was a fellow who was living in the same RV park I stayed in this past winter. Hey thanks for visiting! 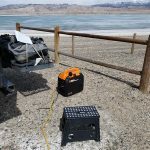 Please DO check out my other posts – along with my suggested RV Accessories page (lots of good stuff at great prices!) and lastly, don’t miss my recent heart attack story. 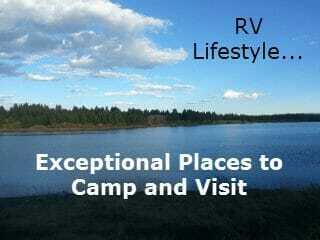 PS – I’m back on the road… here’s my latest adventure in Tough Creek Campground.